As we settle into winter months, we also have to settle into a steadier skincare routine. In a previous blog post, I talked about how important it is to develop a skincare routine where you are cleansing and moisturizing regularly. I definitely needed to take my own advice, so I began looking for a moisturizer suitable for my skin. Luckily, I found the products I desired to add to my routine by doing some research, trying a few samples, and ultimately being introduced to new brands through my Sephora Play subscription box. 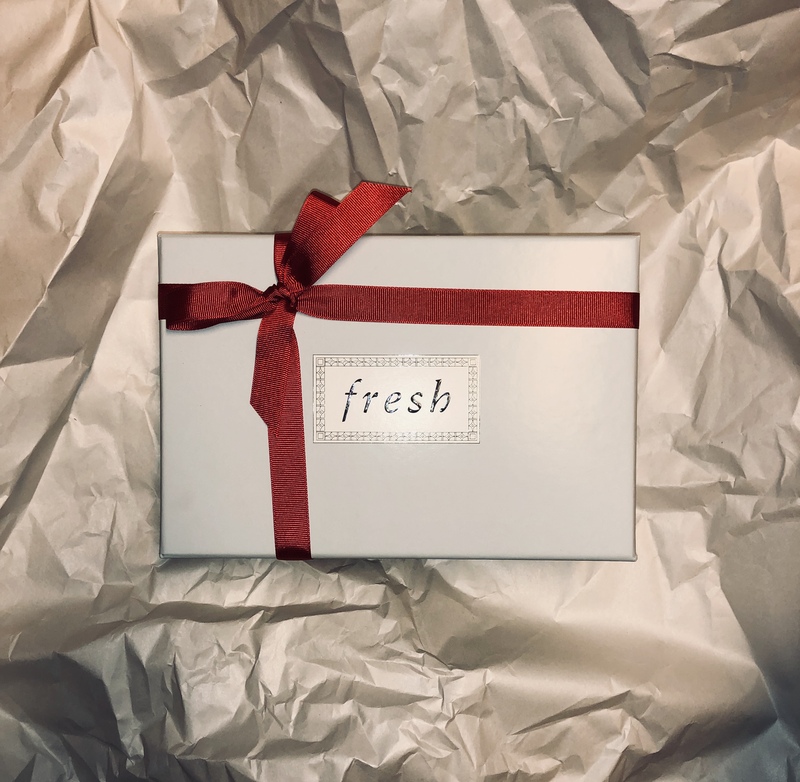 This week, I want to rave about a great skincare brand called Fresh. 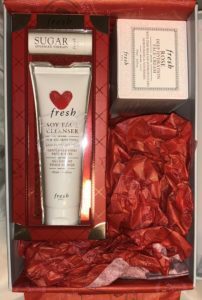 When I started getting my subscription box, I wasn’t necessarily looking for a face cleanser, as I’ve had a hard time finding one that didn’t irritate my super sensitive skin. 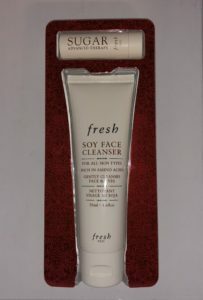 That was until I received the Fresh Soy Face Cleanser in a trial size. This stuff is awesome! The product contains soy proteins, rosewater, and borage seed oil; these ingredients help to gently lift off dirt and makeup while soothing and nourishing the skin. It’s also sulfate, paraben, and phthalate free. It always leaves my skin feeling smooth, helps against acne development, and pulls off the makeup and dirt from my face. It feels so clean and soothing. The best part is the cleansing gel goes a long way, making it a long-lasting product. Now, my favorite part of the day–which used to be putting on makeup–is taking all of my makeup off and taking care of my natural beauty. 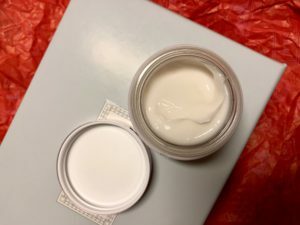 Although I’d found my holy-grail cleanser, I was searching for a moisturizer that was also safe for sensitive skin, did its job, and was actually worth the price. I highly recommend stopping into a local beauty store like Sephora or Ulta and asking for a sample of more expensive products before buying them. 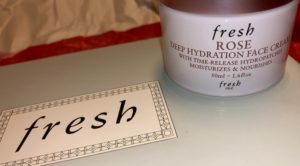 Because I had such a great experience with the Fresh cleanser, I decided to try out the Fresh Rose Deep Hydration Moisturizer. Again, I have zero complaints about this product. It doesn’t make my skin appear oily, and it has cleared up the dry, flaky areas that once plagued my nose and forehead. It’s safe for sensitive skin, and again with its time release technology with infused rosewater, my skin stays smooth, hydrated, and soothed throughout the day. This is another long-lasting and worth-it product for almost any skin type. It’s important to be aware though, that some moisturizers may enhance the look of larger pores. With having this particular skin type, it’s important to remember heavier creams can enhance or clog larger pores and water creams would be more suitable. All this is to say, this Fresh moisturizer hasn’t clogged or enhanced the larger pores around my nose and again I would recommend this product to anyone. Fresh has not only graced our skin with great cleansers and moisturizers, but one of their most well-known products is their lip-balm and face masks. You cannot go wrong with anything from this brand. If you decide to check it out, check reviews and make sure you have no sensitivities to any of the ingredients. Thanks to Fresh my skin is becoming the smoothest and most hydrated it has ever been. Grab a sample, you’ll find yourself falling into a new routine with these lovely products!